Marine Corps Commandant Gen. Robert Neller has ordered all Marine Corps aircraft to suspend flight operations for 24 hours within the next two weeks following the Aug. 5 deadly MV-22B Osprey crash that killed three Marines. The pause in flight operations will not affect operational commitments, the Marine Corps announced Friday in a news release. Commanders can decide when to suspend flight operations. “The intent is for flying squadrons to review selected incidents which occurred enterprise-wide and study historical examples of completed investigations in order to bring awareness and best practices to the fleet,” the news release says. The House Armed Services Committee has repeatedly raised concerns about the state of Marine Corps and other military aircraft since the spring of 2016, committee Chairman Mac Thornberry, R-Texas, said on Friday. The U.S. Marine Corps suspends all aircraft operations for 24 hours after recent MV-22 Osprey and KC-130 Hercules crashes. “The Marine Corps decision to temporarily ground all aircraft is further, indisputable evidence that America’s military is in a readiness crisis, and that the crisis is costing lives,” Thornberry said in a statement.“Washington has asked our military to do too much with too little for too long. The last time the Marine Corps suspended flight operations for all aircraft was in August 2016 following three crashes of Marine F/A-18 Hornets in as many months. Two pilots were killed in separate crashes that June and July: Marine Capt. Jeff Kuss, a Blue Angels pilot, and Maj. Richard Norton, who graduated from both the Navy’s TOPGUN school and the Marine Corps Weapons and Tactics Instructors Course. Investigators later determined that Kuss had accidentally left his afterburners on while performing an aerial maneuver and Norton started a dive too low while practicing a strafing run at night. After an MV-22B Osprey crashed off Okinawa on Dec. 13 and another Osprey’s landing gear failed on the same day, the Marine Corps suspended flight operations for all Ospreys in Japan for a week. 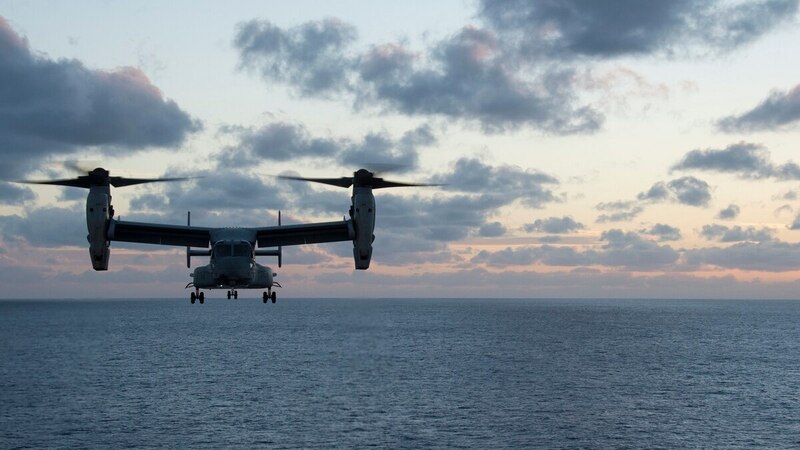 Lt. Gen. Lawrence Nicholson, III Marine Expeditionary Force commander, said at the time that he was “highly confident” that Osprey flight operations could safely resume.